Are you on the hunt for the best crankset for fixie bikes? 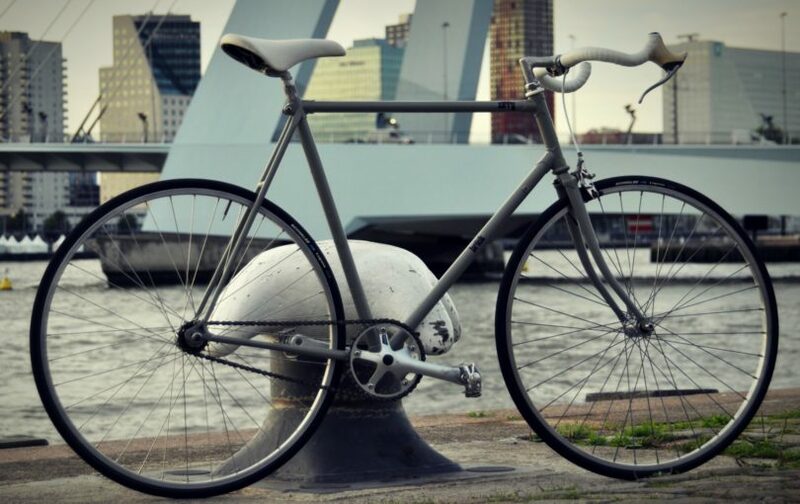 If you're in a hurry I'd go for Restrospec's Fixed Gear Crankset. It's strong, lightweight and cheaper than it's rivals. There's lots of conflicting advice out there about what you need, and what will fit the bike frame, and the accessories you already have. "Gear ratio" for fixie gear bikes is far simpler than standard gearing as you only have one of them! If you look above, you'll see that cranksets have varying amounts of "teeth". These teeth represent your gear ratio, and this is written like 44:16. The first number represents the number of teeth that are on the chainring at the front (44), and the second number is the number of teeth that are on the cog at the back (16). There are lots of possible gear ratio combinations, so to help pick the best gear ratio for you I recommend using a gear inch calculator﻿﻿﻿. The higher the number, the harder it'll be to push, but your bike will go further with each pedal stroke. The lower the number, the easier it is to pedal, but you won't be going as far per stroke. Generally speaking, a mid gear ratio would be around 70 gear inches. If you like to push harder, you can go with a higher ratio of about 80. If you live in a hilly area, you'll want a lower gear ratio, which is anything under 70 gear inches. My personal recommendation is to go for around 16/17 on the back ​cog and around 42/44 on the front. This set-up is a great all round ratio for getting up to speed as well as handling the occasional hill. Top tip: If you're looking to get a higher top speed out of your bike, the best approach would be to switch out the rear cog for a smaller one. 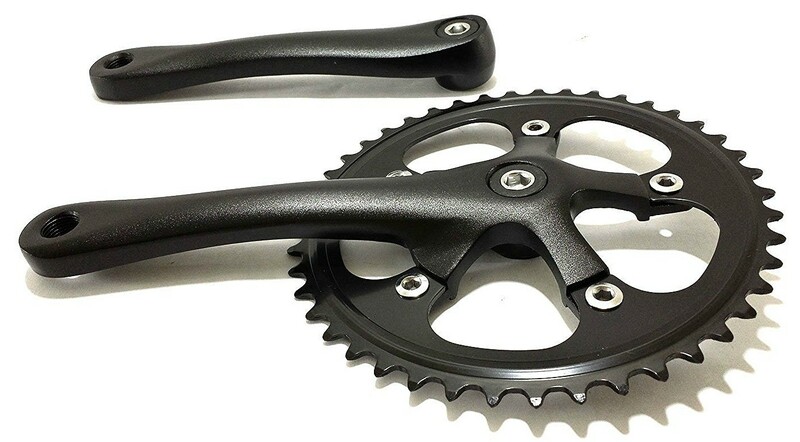 Cranksets come with different crank arms﻿﻿ lengths, which is useful for two reasons. A longer crank arm is going to make your gearing feel easier, and you'll be able to go faster with less effort. However, you'll need to watch out for pedal strike if you're running a fixie gear. Having a shorter crank arm length will reduce the risk of pedal strike. You'll have less power, but you'll be able to ride at a faster cadence. Riding at a faster cadence can help with other issues such as knee pain. Knee pain is often a sign of improper bike fit​, and crank arm length can contribute to this. It's important to investigate other contributors of pain first, like core strength. But if you're still experiencing pain after looking at other sources, changing crank arm length can help solve long simmering aches. Check out the video below by the GCN, which describes selecting crank arm length in more detail. While looking for a crankset, you'll notice that you can often buy them as part of a set (crankset + bottom bracket + chain). Buying them as part of a set is something that I highly recommend as this way you'll know they all fit together. A great fixed gear crankset that comes in multiple colors. Retrospec Bicycles crankset is ideal for someone that's looking to put together a fixie build, as you're able to save money without compromise. It's also the perfect crankset if you're looking to upgrade your road bikes drivetrain. ​Whichever way you look at it this crankset is a nice choice as it combines a light aluminum alloy crankset with a steel chainring. This combination is good because it adds more durability to the chainring. The crankset is made up three pieces and comes in sizes 44T, 46T, and 48T. This is great as it gives you lots of variety and enables you to choose the best size for your riding style. The only downside with this crankset is the lack of choice when it comes to crank arm length. It arrives in a 170mm which is fine for the majority of riders, but you may know you need something else. Comes in a wide variety of colors. Lots of choices when it comes to gear ratios. Takes full advantage of both aluminum and steel metals. Only one option available for crank arm length. Projekt Fixie's Crankset is another superb crankset that's suitable for all types of fixed gear riding. 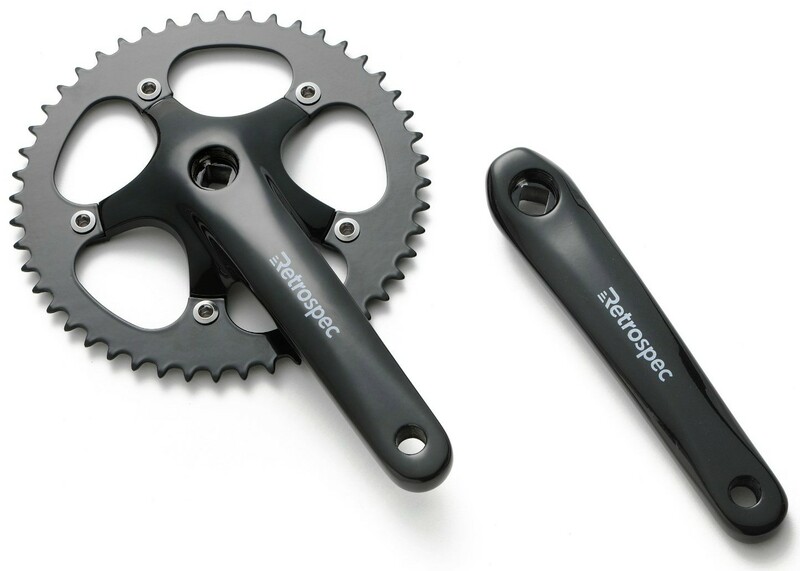 Unlike Retrospec Bicycle's, the crankset only comes in black. However, a significant feature of this crankset is that it's been anodized so that the paint does not chip. This is excellent as it means it'll stay looking fresh through extreme riding and extreme weather conditions. Again, like Retrospec Bicycles, there is only one choice of crank arm length. 170mm is the best length for most, but it might not be for everyone. A classic looking crankset that's light and strong. Origin8's fixed gear crankset has a classic look that's popular with vintage inspired builds or fixed gears that have been built up from classic road bikes. It's made out of forged aluminum alloy which makes it as light and as strong as you're likely to find. The paint job has been anodized like Projekt Fixie's to make sure it lasts as long as the crank itself. 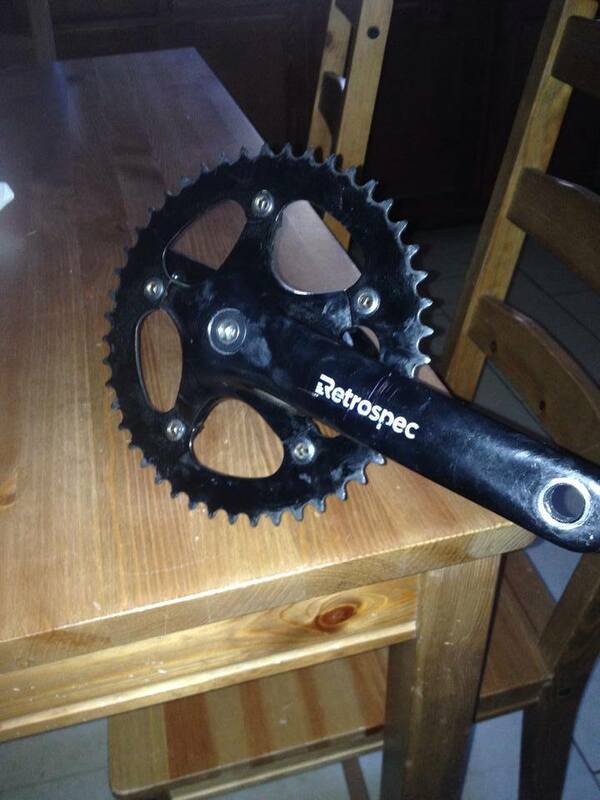 ​This crank has a 46 tooth chainring, which makes it quite high. 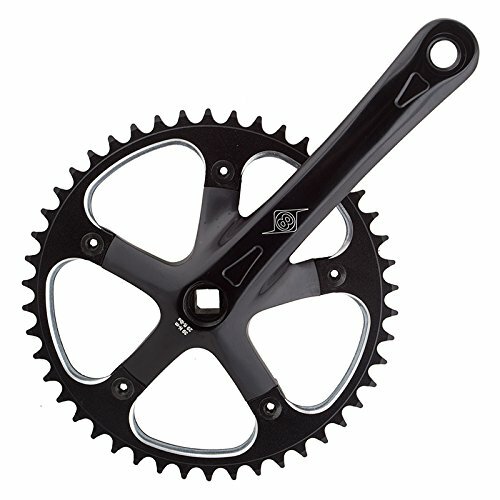 This means it's an excellent crankset for those who want to push big gears and have lots of power at their disposal. If you're looking for a lower gear ratio, you can match Origin8's crankset with a slightly bigger cog at the back of the bike. Another great feature of Origin8's crankset is the large amount of choice when it comes to crank arm length. You can choose from either a 165mm, 170mm, or even a 175mm crank arm length. ​165mm is great for a faster cadence and reduced risk of pedal strike, whereas 175mm is excellent for increased power output, you just need to be a little careful when going around sharp corners. Lot's of anodized color options. Lots of crank arm length options. Retrospec Bicycles has an exceptional crankset that uses strong, lightweight materials, offers a variety of colors and a range of gear ratios at a much lower cost than other models. These attributes make it the best crankset for fixie bikes whether you're building your bike from scratch or upgrading current components.